Lizzie is happy about her friend's burgeoning romance, but less than impressed by Will Darcy, Charles's friend, who's as snobby and pretentious as his friend is nice. He doesn't seem to like Lizzie either, but she assumes it's because her family doesn't have money. It doesn't help that Charles doesn't seem to be asking Jane to be his prom date, or that Lizzie meets George Wickham, who tells her that Will Darcy sabotaged his scholarship at Pemberly. Clearly Will Darcy is a pompous jerk who looks down on the middle class--so imagine Lizzie's surprise when he asks her to the prom! Will Lizzie's prejudice and Will's pride keep them apart? Or are they a prom couple in the making? 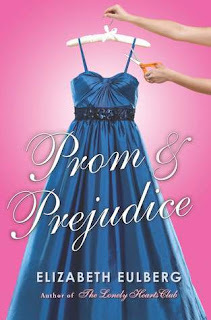 From Elizabeth Eulberg comes a very funny, completely stylish prom-season delight of Jane Austen proportions. As you all should know by now, I love Jane Austen, so if something has "and Prejudice" tacked on to its title, I'll probably give it a chance. I'm definitely hoping to read and review this by the time Jane In June rolls around again. I have yet to read Eulberg's debut novel, but this sounds like such a fun read. Plus, I kind of want the dress that's on the cover. Sounds great, thanks! for the review. The more retellings the better. ;) (fairytales and classics) It wasn't really a review, but anyway I can't wait to read this one either! I too haven't read The Lonely Hearts Club, but it's on my bookshelf.